Lotsawa Rinchen Zangpo (Tib. རིན་ཆེན་བཟང་པོ་, Wyl. rin chen bzang po) (958-1055) — one of the greatest translators of the New Translation period in Tibet. He was born in Reni (rad ni) in the district of Khyungwang in Ngari, western Tibet. He was ordained at the age of 13 by Yeshe Zangpo in Ngari, western Tibet, and was sent to Kashmir three times by Yeshe Ö, the king of Guge. Later, he maintained a team of ten lotsawas and kept them continuously busy with translation. He edited or revised over 150 texts such as the Guhyasamaja Tantra. Among the texts he translated is the Chanting the Names of Manjushri. When Atisha visited Ngari in 1042 he met Rinchen Zangpo and was initially impressed by the depth of his learning. However, when Atisha asked him how he practised the teachings he had received he saw that he did not know how to bring them together. Rinchen Zangpo then received teachings from Atisha, especially on Chakrasamvara. 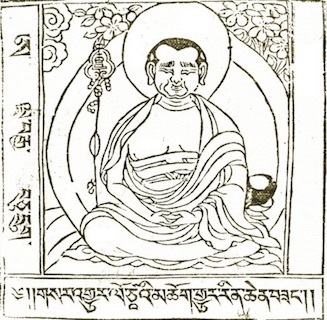 His four main disciples were Lochung Legpe Sherap, Gungshing Tsöndru Gyaltsen, Drapa Shönu Sherap, and Kyinor Jnana. He was also a teacher of Sachen Kunga Nyingpo. Dan Martin, 'Veil of Kashmir — Poetry of Travel and Travail in Zhangzhungpa’s 15th-Century Kāvya Reworking of the Biography of the Great Translator Rinchen Zangpo (958-1055 CE)' in Revue d’Etudes Tibétaines vol. 14, October 2008, pp. 13-56. Patrul Rinpoche, The Words of My Perfect Teacher (Boston: Shambhala, Revised edition, 1998), page 259. Tsepak Rigzin, ’Rinchen Zangpo: The Great Tibetan Translator’ in The Tibet Journal, Autumn 1984, pp. 28-37. This page was last edited on 12 April 2018, at 08:35.